Born in Germany in 1970 and raised in Athens. He studied medicine at the University of Vienna, where he graduated with the title Dr. med. Univ. He was trained in Ophthalmology at the University of Dresden under the supervision of internationally renowned ophthalmologists as Prof. Theo Seiler (Refractive Surgery) and Lutz Pillunat (Glaucoma). From 2001-2005 was actively involved at the glaucoma research group at the University of Dresden. He continued his studies, specializing in Medical Retina, Cataract and Refractive Surgery in the Pallas Klinik in Olten, Switzerland. In 2004 became Consultant of the Ophthalmology Clinic Bautzen Germany, an educational clinic of the University of Dresden. Because of his great experience in retina diseases he was responsible for the training of specializing Ophthalmologists in Fluoresceinangiography and Indocyanin angiography as well as laser photocoagulation. After a 16-year stay in Austria, Switzerland and Germany he returned to Greece in 2006. 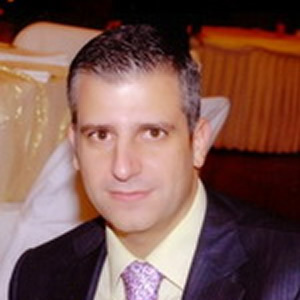 Since 2010 is medical director of the Attiko Ophtalmologiko Eye Center in Athens Greece.